Wish a new job ? Wish a real hands-on experience ? Wish a great career in consulting and implementation ? Wish to make a real difference and real change – not just talk about it ? We are especially looking for people with manufacturing and agricultural experience, operationally and as management. Simply, you need to know what makes a factory to perform well ! Please see details further below. IMPAC® (Improved Management Profitability and Control (Singapore) Pte. Ltd.) -, has openings in in Kalimantan – Pontianak / Banjarmasin / Balikpapan areas for Operational Project Management and Management Trainee positions. Our clients in Indonesia are manufacturing companies as well as agricultural corporations, both large and small. We help our clients to optimize their manufacturing and farming process and increase their output. We work hands-on, on-the-floor and on the grounds of the farming locations. Thus we are looking for people with manufacturing background and/or agricultural management process – with documented on-the-floor experience. In Kalimantan specifically, we are looking for people with experience in managing people and operations within agricultural operations ; and in extraction of natural resources. 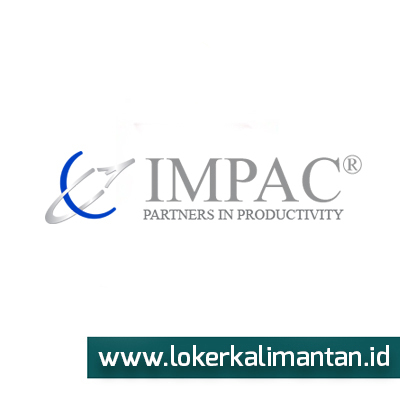 IMPAC® is the best known Productivity Enhancement and Implementation firm in Asia, with more than 30 years of operations throughout Asia Pacific. Through implementation of our IMPAC® System of Management - which uniquely combines Behavioral training, Productivity improvement, and Systematic approach to Management - our clients have saved equivalent of hundreds of millions dollars. Simply, no other management consultancy or productivity implementer can match our performance ! We prefer candidates with education and business experience within Manufacturing / Process / Mechanical Engineering ; Industrial Engineering ; Change management ; Behavioral and Management Training ; or experience gained within Operational Management in Manufacturing ; or Agricultural Operations experience. We would like to see a profile and background focused on Change Management, Training, Productivity Improvement, Productivity Implementation, and Project management in Manufacturing or Agricultural environment. In addition and with combination of the above, if you also have some experience gained in technical and industrial sales, then that may be an advantage. You may have gained suitable experience within Manufacturing and Industrial Engineering positions ; Business Process Re-engineering positions within Manufacturing industries (such as for instance metal-, paper-, wood and furniture-, food-, plastic-, ceramic-, electronics-, electrical-, clothing and apparel-, textile-, rubber- and similar industries) ; Technical and / or Energy conservation positions (say maintenance and technical services) ; PPIC and Production planning positions ; Quality improvement positions ; Behavioral training positions ; Project management and client Training positions within Manufacturing industries ; industrial Project management positions, or manufacturing positions with focus on Manufacturing, Process improvement & optimization and change programs ; supply chain positions etc. You may also have held change management or process engineering positions within Service industries (banking, sales, hospitality, finance, retail, distribution). We prefer applicants with manufacturing experience. We look at your experience combined with your personality and education ; your background may vary. YOU MUST SPEAK ENGLISH WELL. • YOU MUST BE AVAILABLE TO START SOON – typically within 2 weeks from us offering a job to you ! If you are able to produce results in a demanding environment, are looking for a career which offers exceptional growth possibilities, and would be available to start work immediately, please apply by sending an Email with your CV IN ENGLISH, and include your PHOTO as well (mark it as ME EMAIL on the subject line / heading of the email). PLEASE NOTE ONCE MORE, YOUR CV NEEDS TO BE WRITTEN IN ENGLISH, AND YOU MUST BE ABLE TO SPEAK ENGLISH WELL. Our recruitment web-site : www.jobsportal.asia – look at “Positions” and “Careers” pages ! Our main web-site : www.impac-systems.com – look at “About us” and “Million dollar quotes” pages ! PLS. NOTE : WE NEED PEOPLE WHO CAN START WORKING SOON ! WE ARE CONDUCTING INTERVIEWS RIGHT NOW IN JAKARTA ; AND WILL CONDUCT INTERVIEWS IN KALIMANTAN RIGHT AFTER HOLIDAYS. WE ARE HIRING - EMAIL US NOW ! The positions are offered for work within IMPAC®, under our Singaporean company Improved Management Profitability and Control (Singapore) Pte. Ltd. Recruitment process will be managed by our partners at Asia Control Systems Inc., of Manila, Philippines. All positions are local ; and will involve on-location / on-site work with our clients and in our projects located within South and West Kalimantan. No relocation to outside Kalimantan will be required.